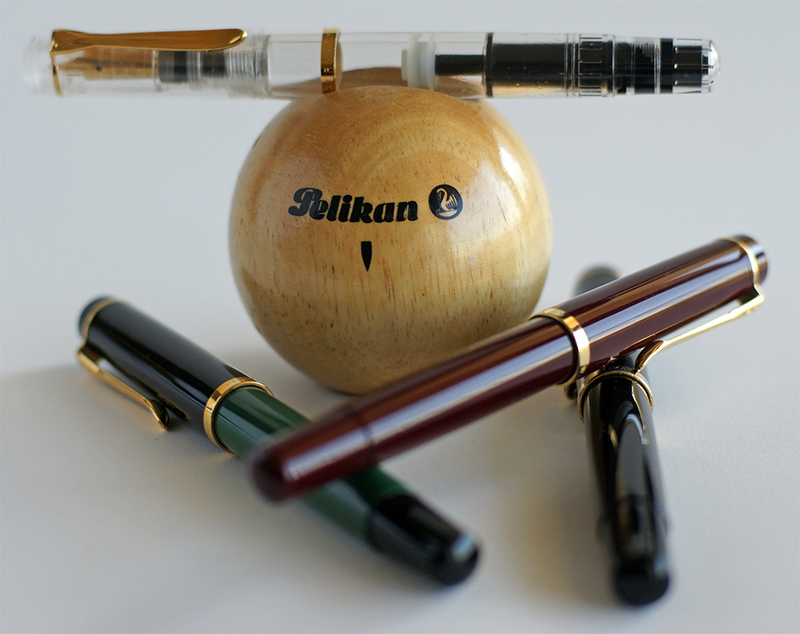 A little over a year ago I posted all that I knew about the Pelikan M481, a little understood model released in the early 1980s. Based on the pen’s design, it was clearly the predecessor to the M200 that followed in 1985. The M481 appears to have been largely relegated to the export market. It is the same size as the M200 but with different furniture. To briefly recount, the M481 has a single cap band, no trim ring on the barrel or piston knob, and lacks the Pelikan logo on the cap top (perhaps its most distinguishing feature). I encourage you to read my previous article linked above if you’re interested in more of this model’s details. Up until now I have assumed that the M481 was limited to a release of just three colors; black, green-black, and burgundy. I now think that there was a fourth model, not quite designated an M481 in name, with enough of the tell-tale attributes to allow one to make a reasonable inference that it was intended as part of that lineage. The variant that I’m referring to is what I now feel to be the previously misclassified M200 clear demonstrator, single cap band variant. 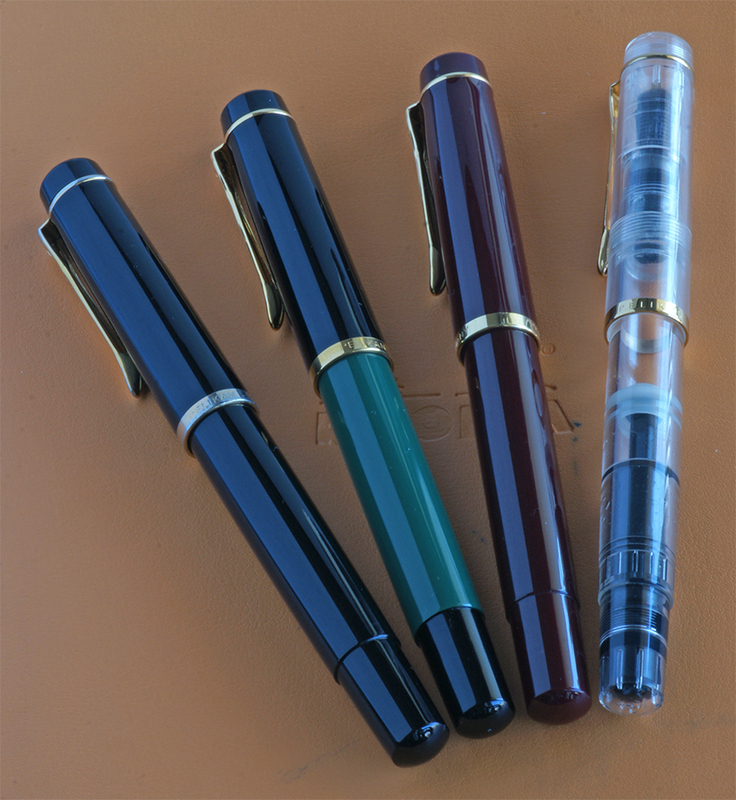 There has long been considered two variants of the M200 old-style clear demonstrator. One model of demonstrator has the furniture that you would expect from most of the old-style pre-’97 M20o releases. 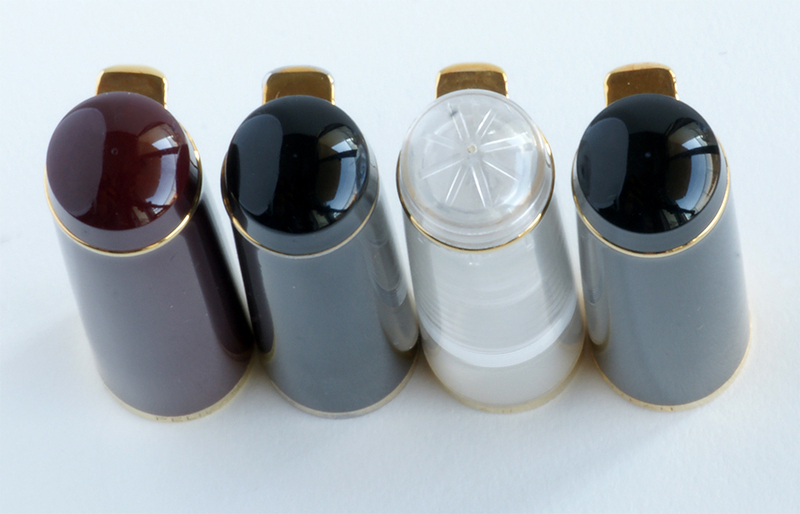 The most characteristic of these features being the double bands at the lip of the cap. There has always been another variant which has seemed to never quite fit. It is very similar to the M200 release with the exception of a single cap band. Top: M481 clear demonstrator (single cap band). Bottom: M200 clear demonstrator (double cap band). I was recently looking through my archives and again found an excerpt from a Japanese catalog from the late 1980s. In that catalog, a page with the heading “481/150/100” depicts this single banded model though separates it from the other M481s rather conspicuously. While my Japanese is a bit rusty, I can assure you that nowhere in the model description is the term M481 used. Still, the trim and size of the pen is unmistakably identical to the other M481s. That catalog page dates to at least 1987 as evidenced by the inclusion of the white M150 “Stormtrooper” (released March 1987). This would have been at least two years after the M200 was officially released (early 1985). That page does not make a single mention of the M200, leading me to conclude that this single banded clear demonstrator model was never intended to be classified as such. The Japanese translation of the description in the catalog indicates that the pen is called “Peri-suke.” Peri is the Japanese abbreviation for Pelikan and suke refers to translucent. 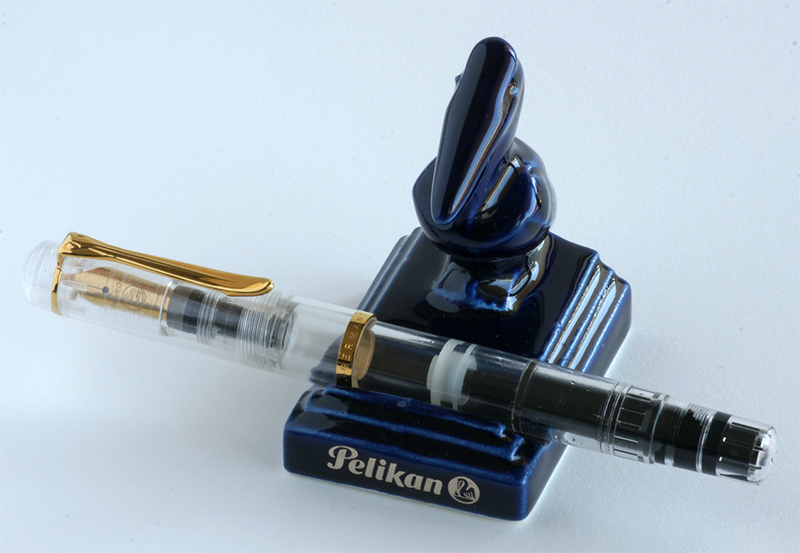 Putting it together, the pen is listed simply as a Pelikan Demonstrator without mention of a model number. 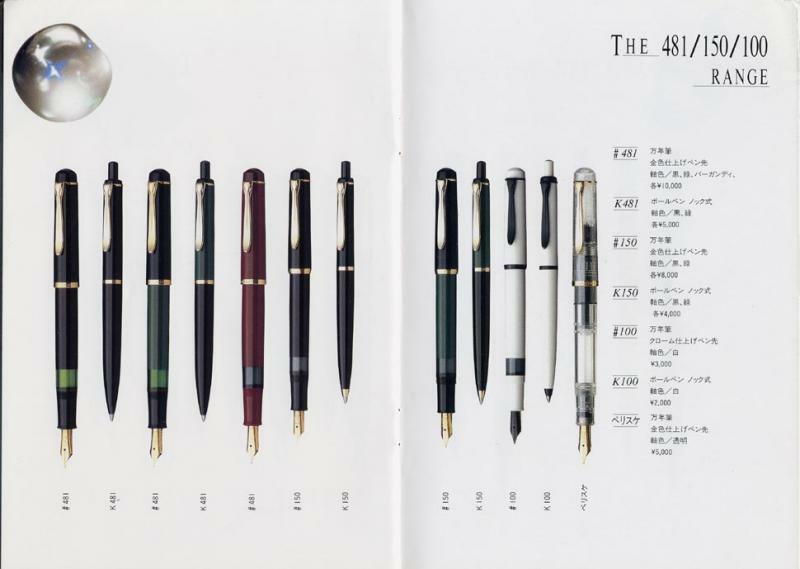 In discussing this with some Japanese pen enthusiast, I learned that in the 1980s, demonstrators carried a bit of a stigma amongst the Japanese as they were thought to be rather cheap looking. That might explain why the labeled M481s are priced at 10,000 yen (~$62.50 in 1987 dollars) while the clear demonstrator commands only half of that price at 5000 yen (~$31.25 in 1987 dollars). Still not entirely sure as to how this single cap banded variant fit into the landscape, I turned to Jürgen Dittmer, the head archivist at Pelikan. His response to me was that no pre-’97 variant of the M200 was ever released with a single cap band aside from the brown tortoise variant. Based on the circumstantial evidence available and the expertise of Mr. Dittmer, I am now inclined to conclude that this Perisuke, single cap banded variant is actually closer in lineage to an M481 rather than the M200. I have adjusted my database and all preceding articles to reflect this new belief.